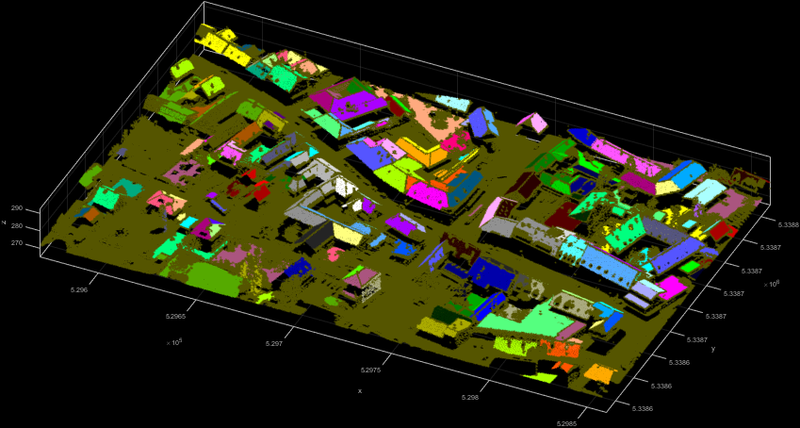 Provides methods for point cloud segmentation based on local homogeneity using either a generic region growing approach or an adapted region growing for plane extraction. As the single points in the point cloud do not contain information about the connectivity and structure of scanned objects, segmentation is needed to group points with similar properties. This module provides two different segmentation methods, that are both based on the seeded region growing approach. In both segmentation modes, a proper homogeneity criterion allows to detect segments for objects of interest. Every neighbouring point that fulfils the criterion gets added to the list of seed points of a segment. Subsequently, each added segment point will be selected as seed point for the region growing and performs its local homogeneity check (-> go to 2). If all points in the list of seed points were processed, which means no new points can be added to the segment, the segment will be closed. The segmentation continues with the remaining points, that do not belong to segments yet, (-> go to 1) until all points are processed. The final segment ids of the points are written to the ODM predefined attribute SegmentID. Because of noise in the data some very small segments occur in the segmentation process. In most cases we are not interested in these tiny "noise" segments, thus a minimum segment size (minSegSize) can be specified (default=100 points). The segment id is only assigned to segments with at least minSegSize points. For smaller segments the SegmentID is set to null. Point attributes can be accessed for the seed point as well as for the neighbour point (n) (see Examples). To get meaningful results in the seeded region growing, the criterion should test a local relationship between seed point and neighbouring point in a symmetric way. Only if the homogeneity criterion is symmetric, which implies that the check of the criterion P delivers the same result in both directions for a point p and its neighbour point n, the result is independent of the ODM tile size and the selection of the seed points. If a non-symmetric criterion is chosen, the results of several runs of the segmentation may differ because of the random seed point selection. The adjusted segment plane gets updated gradually as new points are added to the segment. The plane parameters are only updated if the standard deviation of the plane adjustment for all segment points is lower than planeExtraction.maxSigma. This prevents, that the plane moves from one planar area to another, resulting in a wrong segment. A major difference to the default conditional clustering is, that the seed point order plays an important role for the detection of planar segments. While the seed points can be randomly selected in the conditional clustering (with a symmetric criterion), the planar surface extraction needs initial seed points that lie within a planar area to get stable initial plane parameters for a segment. To select appropriate initial seed points the parameter planeExtraction.seedCalculator can be used. By default the planeExtraction.seedCalculator sorts the points by the standard deviation of the normal vector calculation (NormalSigma0). In general, the generic calculator should return a weight for each point that might be initial seed point of a segment. Based on the returned point weight the seed points are sorted in ascending order. This means, that the region growing starts at points with a low weight, which are assumed to be in planar areas. Note: To use the plane extraction on a point cloud, opalsNormals needs to be run first. Specifies the opals datamanager (ODM) input file. Choose between conditional clustering and plane extraction mode. All points within the search area (search neighbourhood) are considered in the local homogeneity check.Depending on the parameter searchMode the size/shape of the search query object can be defined. Wheras infinte cylinder (d2) and sphere (d3) queries take a single search radius only, cylinder (d2_5) queries accept up to three distance values: radius of cylinder, dzmin (relative height of the cylinders bottom; usually negative value), dzmax (relative height of the cylinders top). If only the cylinder radius is defined, dzmin is set to -radius and dzmax to radius. In case of two values, the cylinder radius is set to value(1), dzmin to -value(2) and dzmax to value(2). The segmentation method searches neighbouring points within a infinte cylinder (d2), a finite cylinder (d2_5) or a sphere (d3). This parameter specifies the minimum number of points per segment. Only segments with at least minSegSize points are valid and thus points in smaller segments do not get a segment id. One or two filter strings in EBNF syntax (as described in section 'Filter syntax') can be passed to restrict the set of input points. The first filter specifies which take part in the segmentation process (if not specified, segment computation is carried out for all ODM points). The second filter defines the points that can be used as initial seed points of a segment.If not specified, any ODM point might be processed as initial segment seed point. These parameters are only used in the plane extraction mode. This parameter defines the maximum distance of a point to the adjusted segment planeto be added to the segment. The adjusted plane, which represents a segment, gets updated from time to time. The plane parameters get updated if the new adjusted plane fits well enough (sigma0 < maxSigma). This calculator should return a numerical value (weight) for each point, which can be used for the calculation of the seed point order in the segmentation process.The seed points are sorted in ascending order of the numerical value of the calulation.For the conditional clustering the points are always selected randomly (result is independent of seed point order). For the plane extraction the seed points are ordered by the NormalSigma0 value by default. The segment bounding boxes get written to the opals datamanager (ODM) at the given file path. Note: Existing odm-files will be overwritten. opalsImport -inFile strip21.laz -tileSize 100 -filter "generic[z>265]"
The dataset (residential area) contains points on bare ground, house roofs, power lines, cars and vegetation. The second dataset contains an ALS point cloud that contains railway tracks and vegetation. The first example uses an 5° angle difference criterion between adjacent normal vector. opalsSegmentation -inFile strip21.odm -searchRadius 1 -minSegSize 75 -criterion "normalX*n.normalX+normalY*n.normalY+normalZ*n.normalZ>0.996"
Remark: The constant 0.996 in the above homogenity criterion approximates the cosine of 5°. 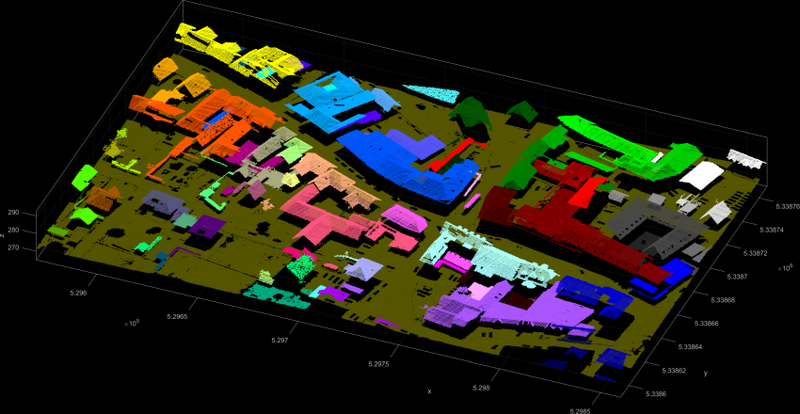 Figure 2 shows the resulting 3D point cloud coloured by SegmentID. The second example uses the difference in the z-coordinates of neighbouring points as local homogeneity criterion. Neighbouring points belong to the same segment if their difference in the z-component is below 15 cm. The resulting Figure 3 shows spatially connected roofs in the same segment. opalsSegmentation -inFile strip21.odm -searchRadius 1 -minSegSize 100 -criterion "abs(Z-n.Z)<0.15"
The third example uses the railway.laz dataset to show a very basic use of the plane extraction. The fourth example shows a more specific use-case for the extraction of planar segments within a given region. Segment seed points have a NormalSigma0 of less than and need to be at a height of Z > 275 m. Thus the resulting segments in Figure 5 show extracted roof faces. opalsSegmentation -inFile strip21.odm -searchRadius 1 -minSegSize 50 -method planeExtraction -maxDist 0.2 -maxSigma 0.15 -seedCalculator "NormalSigma0<0.02 AND Z > 275 ? NormalSigma0 : invalid" -filter "Region[529568.8 5338773.5 529863 5338773.9 529862.6 5338642.4 529706 5338685.4 529569.1 5338753.8]"